A Melbourne Mum of two with an active 4 year old boy and an inquisitive 1 year old girl.I have a background in Beauty therapy / Health Science – I worked for Jurlique for many years ( an Australian/organic skin care company). Now I have the flexibility of being with my babies and working on building / developing projects with my husband & having an input with the design/styling part of things (the fun stuff). I love travelling and visiting new places & have a passion for Style ( interior and fashion ). 2. What is your favourite item in your wardrobe? 4. What do you love to wear on a night out without kids? 5. What has been one of your most recent ‘fashion fails’? Buying uncomfortable shoes. I buy thinking I will “Break” them in……… then I never end up wearing them!! TIP- buy shoes that are like slippers on your feet the first time you buy them. 6. Accessories: Less or More? Less – One or two statement pieces is more than enough! 7. What’s on your Wish List for this season? 8. Shoes: Heels or flats? I have so many but a stand out is Zimmerman. 10.What is your go to ‘Mum-On Duty’ outfit? I must say I always make an effort even if I am “mum on duty”. It varies between Sportswear (lululemon or Stella McCartney) or Jeans and t- shirt paired with a blazer or cashmere sweater. In the warmer months an easy to wear dress, silk or denim shorts. My IRO Leather jacket – took me five years to find it so it’s now a firm favourite, although probably isn’t worn enough in steamy ol’ Brisbane. Need a few trips to Melbourne each year to give it more of a run. Oh, how does one choose? I love both dearly … With a push I’ll say shoes. My Nanna managed a shoe shop for years so I’ll blame her for my deep shoe love. What do you love to wear on a night out without kids? I am a jeans addict – at last count I owned just over 40 pairs so it’s safe to say that I have a denim obsession. Whenever I can I will wear jeans, so on a night out I love to keep it fairly simple – a good spray tan, white tee, jeans and heels with some killer jewels. This too is a tricky one! I adore the minimalist look at the moment, clean lines, lots of white with really simple jewels, however I really do love massive earrings and stacks of bangles. I’m a mixed bag when it comes to accessories – I’m kind of like a patchwork quilt – a bit of everything. My current love affair with Christie Nicolaides Jewellery is getting a bit out of control, her earrings are just divine! (And are right at the top of the Christmas List). Hahahaha!! Just read onto this question! A pair of silver hooped Christie Nicolaides earrings and a Sancia cross body bag … Adore! These two goodies will see me more than happy til next season. Heels whenever I can … However the reality of running around after a one year old requires flats to be the current go-to. Right now Zimmerman can do no wrong and Gail Sorronda is amaze! What is your go to ‘Mum-On Duty’ outfit? AG Jeans, Cotton On tee (usually white or khaki), Golden Goose or Lacoste trainers. What are you favourite ‘Affordable Fashion’ buys? Oh goodness, there are so many affordable goodies out there at the moment, that are not only at the right price point but also good quality. As mentioned above Cotton On tees are really great at the moment, Superga trainers are killing it for around $100 mark, Glassons jeans are another really unreal buy for not much outlay, striped tees by the brand Little Lies are unreal at $34.95 … I could go on and on. Probably my favourite right now is jewellery range by Tassie girl – Mimimalist Jewellery – Amelia’s stuff is crazy good for crazy low prices (@minimalistjewellery on Instagram). I’m a bargain shopper when it comes to Tilda’s clothes – she grows far too quickly and LOVES wearing little cotton bike pants so I’m regularly at KMart and Big W, however H&M is my favourite with their organic cotton range – they wash so well and the cotton is super soft. She always has good shoes, once again having a Nanna who managed a shoe shop and a Mother-In-Law who also works in a shoe store has ensured that Tilda is always in well fitting, well made shoes. What is you best tip for dressing for a special occassion? Make sure the outfit fits your body shape … If you have to hitch it up or you keep pulling at it then it’s not quite right. The perfect outfit for a special occasion shouldn’t need any extra help or fixing, that way it will be worn with comfort and confidence! If you could only get your hair, make up or a spray tan done for a night out which one would you choose? Todays Style File is on Olivia White from House Of White. Although not strictly a fashion blogger, she runs a very successful Motherhood and Lifestyle Blog and is super fashionable. She is married and has one daughter Annabelle and is currently pregnant with another little girl. She is also a self professed lover of cats and this is where I’m not sure we can be friends ;). Olivia has absolutely nailed dressing for pregnancy and she rocks a body con dress like a boss. Check out her blog on the link above and follow her on Instagram @houseofwhite_. Black dress, heels and a killer lippy colour! What has been one of your most recent ‘fashion fails’? Leggings and t-shirt with my cons or nikes! What is your best tip for dressing for a special occasion? 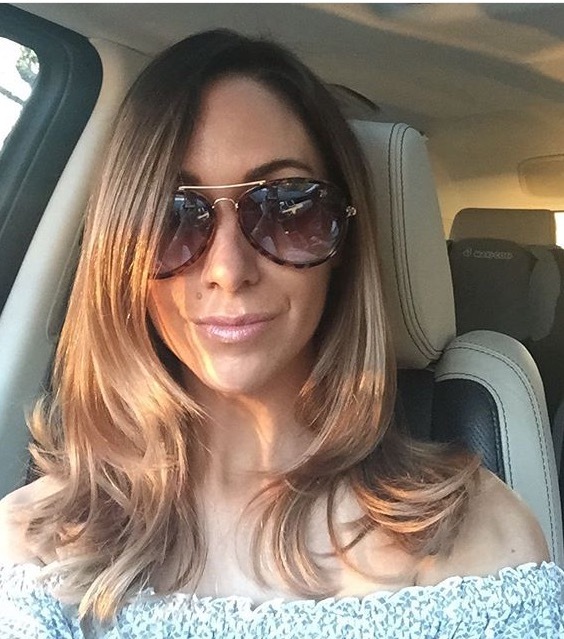 Lauren or Mrs Lauren Roney as she is known on instagram is a loved up married Mummy to one sweet little girl, living a sparkly life in the suburbs of Brisbane. She spends her time chasing her gorgeous wee girl and a bargain. Casual Timeless Sparkle , I love timeless stylish pieces that I can add my personal touch too, a statement necklace here , a leopard scarf there. A fabulous frock and heels, oh how I miss heels… and lippy. I don’t wear lippy so much now I have a beautiful bebe I want to kiss constantly. I don’t like to think I have “fashion fails”, more regretful purchases, remember said lace dresses still hanging in my wardrobe begging to be worn. Over sized lace blouse, anything off the shoulder, dress shorts and wedge heels. I love Louis Vuitton for handbags, Samantha Wills for fine jewellery and Fleur Wood always has beautiful pieces. I have found a huge amount of affordable and more individual fashion in instagram lately and I am loving all the fabulous little stores. Like Feather & Noise, Fetching Leopard, Dress Temple and Sizeable. 10. What is your go to ‘Mum-On Duty’ outfit? 11. What are you favourite ‘Affordable Fashion’ buys? Simple tees, scarfs and beads, all can make you feel fresh and give your wardrobe a lift and injection of new. 12. Where do you like to shop for your kid/s? Target has the best kids clothes hands down for my little bebe, she is petite and I find the Target clothes last wash after wash and have great designs. 13. What is you best tip for dressing for a special occasion? Plan ahead, seriously plan every detail so you are not rushed, try on your outfit with the shoes, accessories and underwear and make sure it fits well, works together and will suit the event and potential weather. 14. If you could only get your hair, make up or a spray tan done for a night out which one would you choose?